The Velveteers band again. This month we decided to challenge ourselves with making savory Verrines. 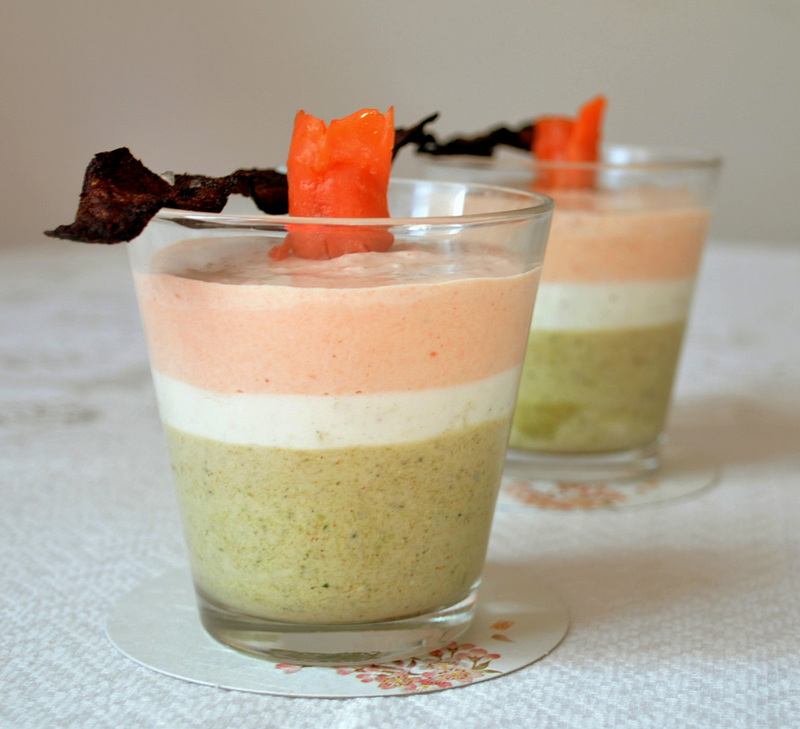 A verrine is a confection, originally from France, made by layering ingredients in a small glass. It can be either sweet or savoury, making a dessert or snack (source: Wikipedia). 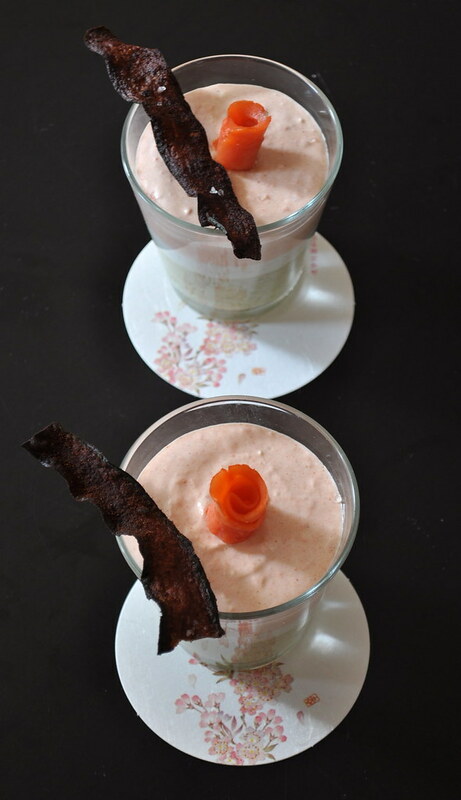 Around the blogosphere, there have been many a verrine showcased but they were mostly of the sweet kind. And, so, we decided to go savory (I must say, that, was well received by Mr. FSK as well!). To push the envelope even more, each of us, Pam, Al, Aparna and I, chose one ingredient that must be used in our verrine. So we came up with - salmon, chocolate, cheese and squash; quite an eclectic combination, especially with the chocolate throwing one off the loop! I have long wanted to make verrines and have dreamed up quite a few flavor combinations, sweet and savory, that I have jotted down as drafts in my mailbox, my virtual notes diary. I had even bought glasses for them a couple of months back. But, this was the first I was actually executing. So, I was really thrilled and looking forward to it. I was reasonably sure on how to use the squash, salmon and cheese but the chocolate was testing me quite a bit. Finally, I decided to use cocoa and pair it with zucchini (for the squash) because honestly, I could not think of anything to pair with that made sense with the rest of the ingredients. 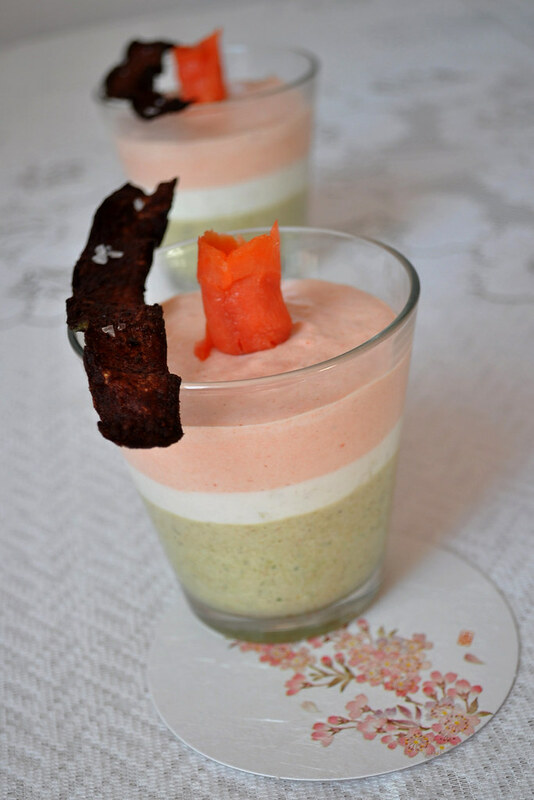 I had decided to make a Zucchini-Cocoa Mousse and Salmon Mousse. However, they did not quite seem to just go with each other on their own. I felt there needed to be a coordinating layer or sorts. When I tasted the zucchini-cocoa mousse, I felt like it needed a bit of kick. So, I went back to the drawing board. I wanted something light so as to not overpower either the zucchini (which is quite delicate in flavor) or the salmon and yet connect them seamlessly. Citrus popped into my head as did ginger. Both, I think pair very well with zucchini and salmon individually and I figured that should work. So, became my middle layer of Lime and Ginger Mousse. I made the zucchini and lime layers with whipped cream and used Cream Cheese to make the salmon mousse, lending it a richer texture. To top it off, I made a chilli-cocoa crusted zucchini chip. Verdict: The verrine was really good. The flavors came through individually and melded well together. 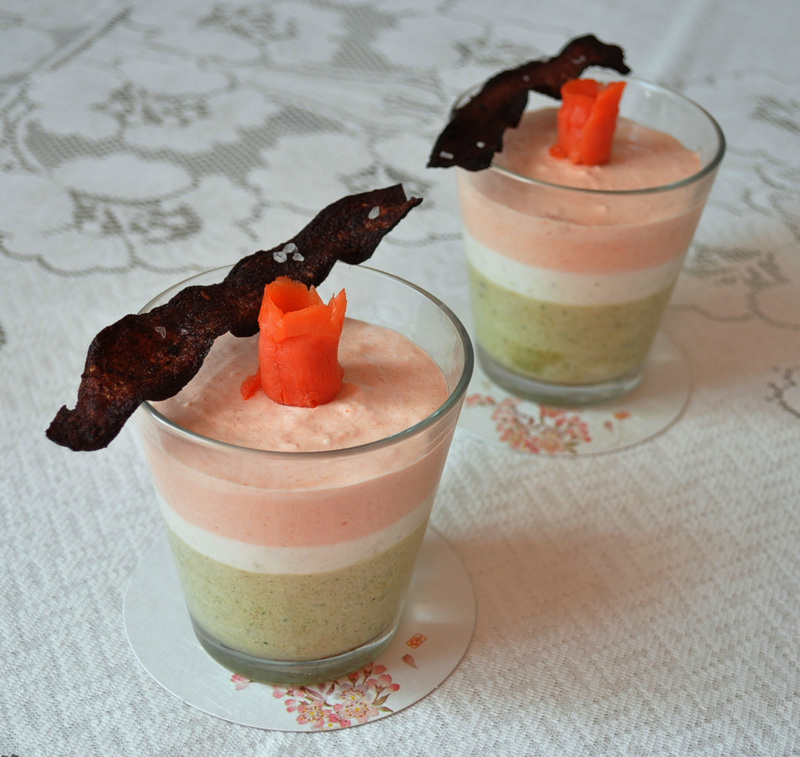 The citrus kick was just enough to lighten the richness of the salmon mousse and brighten the zucchini. I think the chip was a bit overpoweringly bitter, probably because I used a lot of cocoa. Next time I think I'll sweeten it with some honey for a mellower flavor. All in all, Mr. FSK polished them off eagerly; So, I call it a success! Blanch the zucchini in hot water until translucent. Transfer immediately to ice cold water to retain the green color. Let it cool. Meanwhile, dissolve gelatin in a tablespoon of hot water. Puree the cooled zucchini with the gelatin water to a smooth texture. Fold in cocoa, dried zucchini powder and season with salt and pepper. Whip the cream to stiff peaks and fold in half of it to the zucchini mixture. Divide the zucchini-cocoa mousse equally between two glasses. Cover with plastic wrap and refrigerate for atleast 4 hours to let it set. Note: You can make zucchini powder by thinly slicing zucchini and letting it sit in an off oven overnight or until it has completely lost it's moisture content and then grinding it to a fine powder. Combine the zest, juice and ginger. Add the gelatin and heat the mixture until the gelatin dissolves. Season with salt. Fold in the whipped cream and layer over the zucchini mousse layer. Let set in the refrigerator for atleast 4 hours. Dissolve the gelatin in the hot water. Whip all the ingredients together to make a smooth, creamy mixture. Pipe into the glasses over the lime mousse layer. Allow to set for atleast 4 hours. Mix together the honey, cocoa, paprika and salt and rub the zucchini slices generously. Cover with wrap and let marinate for a few hours. Deep fry them to crisp and sprinkle with sea salt crystals. Velveteers was started by Aparna, Asha, Alessio and Pam, who are passionate about different cuisines and food in general. Each month, we will attempt a new dish and share our experiences and the recipes we used. If you’re interested in joining the Velveteers, please feel free to drop by our food blogs and leave a comment.